Special Agent Nicholas Keegan would like to spend more time with his wife, but he just can’t lay off his work as a forensic criminologist for the FBI. When he spearheads an update in the ineffective national criminal database ViCAP, collating previously unentered data, patterns start emerging and Keegan realizes that a brutal crime he’s investigating is really just one in a series of murders. I don’t read a lot of police procedurals, but when I do I like them to keep me glued to the book, worried about what happens next. Chaos didn’t disappoint. I was totally invested in what would happen when Keegan and his psychopathic adversary Zorin finally met. Keegan was an engaging character, and I cared about his troubles, but the real attention-winning character for me was Zorin. I wanted to know more about him, why he was the way he was, what he was going to do next. I admit to spending a lot of time reading Zorin’s blog posts on EnterTheMaelstrom.com before ever reading Chaos, so I already knew some of what Keegan was going to discover. But that just made the discoveries all that more exciting. I love Schuette’s idea of making a real-life blog for a fictional character. It gives potential readers a taste of what’s to come, or it can be left as a treat at the end for readers who worry about spoilers. It also gave the serial killer Zorin a life of his own – it showed both sides of the bloody quarter. Hi Rachel! First, thanks so much for this opportunity. I really appreciate you taking the time to read Chaos and providing feedback to me and to your audience. 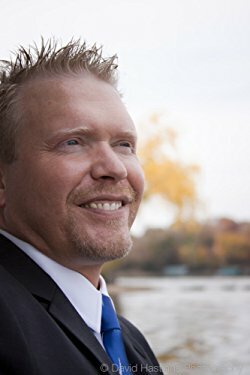 I’m currently a full-time author and editor from Minnesota. Prior to deciding to focus exclusively on writing, I spent many years in retail management, including about a decade working for Borders and Barnes & Noble, constantly indulging my passion for the written word. On the personal side, I’m married to a brilliant and gorgeous woman (who’s fortunately never figured out that she’s way out of my league). My wonderful twenty-four-year-old daughter is getting married next fall. And my Sheltie-Poo, Pogo, is the sweetest and cutest (and possibly the loudest) little dog around. In a perfect world, I’d get to tell stories for the rest of my days. Bestsellers would obviously be great, but really, I see that as more of a means to an end. I want to reach as many readers as I can—and not just in a “get a book in their hand” kind of way. I want to reach them. To get inside their heads and hearts and make ‘em feel stuff—be it terror or frustration or joy or wonder or hope or just an appreciation for the beauty of language. As a reader, I’ve been taken on some incredible journeys that will stay with me forever, and I hope to have the good fortune (and the skill) to pay that forward a little. Yes! Waiting in the wings for final edits is a Young Adult fantasy tentatively titled Aurix the Bold. I’d liken it to Eragon, or perhaps The Hobbit (albeit without nearly the literary brilliance). In it, a boy named Aurix sets out to face the merciless tyrant Ra Xu’ul, who slaughtered thousands (including Aurix’s parents) in a single blow with the sword of a god. Xu’ul seeks the remaining seven God-Forged relics, which will grant him the power to remake (or unmake) all of existence. With the help of Shlee, a crazy old coot who claims to be nearly 500 years old, and a shaggy, reeking mount named Nyx, Aurix navigates the treacherous continent of Valeria to avenge his parents and save his world from a madman. Hopefully, I’ll get to spend lots more time in Valeria in the near future. Do you plan on writing more books? Of the same genre or different? Absolutely! There are currently several underway. One somewhat unique goal that I have is to write a book in all of the major fiction genres. Mystery and horror are personal favorites, but I’d love to give sci-fi and even romance a go. In my current queue, I’ve even got a humorous non-fiction guide to navigating the sometimes-treacherous winters of Minnesota. I keep a list of my current works in progress along with their statuses on my website with the goal of keeping me honest (and hopefully) productive. Talk about a loaded question! Shakespeare and Poe probably most taught me the beautiful potential of words. Stephen King is an all-time favorite—every time I close one of his books, I’m absolutely compelled to write. Clive Barker showed me that there are no limits except those that we place upon ourselves. As far as inspiration for Chaos, I must give credit to Thomas Harris for giving me permission to root for the bad guy just a little, and to Cody McFadyen who forced me to go deeper into the abyss to find Aleksandr Zorin. If you enjoy Chaos, I can’t recommend McFadyen’s Smoky Barrett series enough- Shadow Man is like a sucker punch to the gut. You’re welcome. In addition to Chaos, you created a blog “written” by your serial killer. Where did you come up with this idea? What were you trying to do? Did you succeed? In many ways, Aleksey Zorin is the main character of Chaos. I couldn’t possibly explore his psyche enough in a mere few hundred pages. The Maelstrom (www.enterthemaelstrom.com) gave me a chance to plumb the depths of his history, mythology, and madness in rather more explicit detail. These first-person accounts of his oft-cruel adventures sometimes break the conventions that aren’t always considered acceptable in mainstream writing. But that’s often the stuff that is most real, most gripping, and most heart wrenching. It’s what the good guys have to endure and live with in their pursuit of the bad guys. I think it’s incumbent upon me to look that darkness in the eyes a little bit if I’m ever to write about it in a compelling, realistic way. I see The Maelstrom as the horror to Chaos’s mystery. It’s not going to be for everyone, but I do think it has its place for those who want to descend deeper down the rabbit hole. And some of it is just plain fun. Zorin likes to play. There are even a few little hidden surprises there for those who care to look. In Chaos, you introduce ViCAD – a nationwide database to help detect serial crime. How much of this database is based in truth? Please share your thoughts on the system. To the best of my knowledge and research, everything I share in Chaos about ViCAP (Violent Criminal Apprehension Program) is true. In a nutshell, it’s a warehouse of violent crime data. If Officer Jones in Montana has a strange case, he can enter the details about that case into ViCAP and it (with the help of Bureau analysts) will flag any potential “linkages” to other, similar crimes across the country. This is especially helpful when there’s a mobile offender committing crimes in different geographic areas. The problem is that ViCAP has historically been very cumbersome. Its use has always been discretionary, and the questionnaires were long and tedious—a deterrent to busy law enforcement officers already inundated with their own paperwork. Established in 1985, ViCAP houses information on about 90,000 violent crimes, which sounds great—but given there are nearly 100,000 or so qualifying ViCri cases every year, it’s woefully ineffective. The FBI has long said there are about 35-50 serial killers out there at any given time, but considering ViCAPs deficiencies, I have to wonder how many more linkages might be out there. ViCAD (Violent Crime Analysis Database) was borne of that curiosity. I wondered what we might find if we fed ViCAP all the data—those millions of missing cases. Would we discover another fifty serial offenders? A hundred? How many more predators are out there? I wanted that question to serve as a disturbing backdrop to Chaos and the subsequent books in the series. You had a lot of very dark scenes in Chaos and the accompanying blog. How much trouble did you have writing these scenes? I’m not sure what it says about me, exactly, but frighteningly little. If anything, I have the hardest time deciding where (or if) I should draw the line. The better I know my characters, the more they tend to whisper in my ear. I’ve been developing Zorin for a number of years, and I’ve done quite a bit of deep research on psychopathy and killers, so I know him quite well. Perhaps unsurprisingly, he likes to visit me late at night before I fall asleep. Most often, I write him in the dark by the light of my phone. Maybe the only thing I can say in my defense is that the greatest heroes are born only in the face of the greatest evils. I need one to have the other! 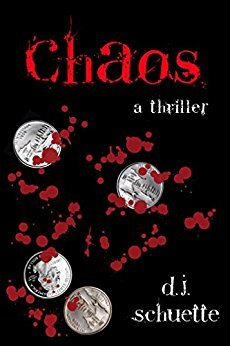 Will there be a sequel to Chaos? If so, when will it release? Yes! Maelstrom is the second book in the series, and I’ve included a teaser of the first three chapters at the end of Chaos. My hope is that Maelstrom will be ready for release around this time next year, though that will depend somewhat on my workload, other projects, and demand. My website is probably your best bet. Feel free to send me a message anytime. There’s a “contact me” button on every page, and I try to respond to every message.